6 smart outlets – independently control 6 smart outlets, and charge 3 devices with built-in USB ports. Energy monitoring – monitor how much energy devices connected to the power strip consume. Just got mine today. In the Kasa app, each outlet shows up as a separate “plug”. I added it to HA but it doesn’t show all the outlets and only shows as 1 switch but doesn’t actually control it. I’m not a programmer but I’ll take a look at the code to see if I can figure something out but if someone smarter than me wants to take a crack at it then I can be a guinea pig. I just received one of the 2 outlet units (the (HS107) and suspect it will behave the same way your describing the HS300. Will try to test it out this week and maybe we can look at the code together (I am not a programmer either). Got mine today, I like it already. 6 plugs per power bar, each individually metered & switched. 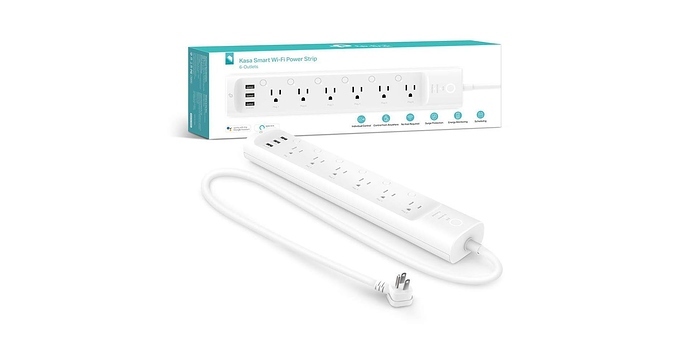 I think this is the cheapest PDU (per outlet) that has both switching and metering per outlet. It looks like support first needs to be added in the underlying library pyHS100, then added to home assistant from there. Is this TP link power strip now able to be used in HA? Are things on the Git Hub end all solved? If so, how does this get pushed to the HA for future updates and use? I will be receiving my hs300 tomorrow… If I can’t find any effort for support in tp link switch component of HA, I’ll be taking a stab at updating it for pyHS100 repo branch. Right… I meant extending Home Assistant’s integration for those changes. Am I mistaken that the TP Link Switch component needs to be modified, or another component created – new: ‘TP Link Strip’ inside switch domain perhaps? I just picked up a few of these as they were just what i was looking for. how far are we from getting HA support? The pull request to add HS300 support to the pyHS100 got merged. I’m looking into what it’s going to take to integrate into home assistant. Thanks Alex-M-GitHub! On behalf of the non-techinical users, I appreciate your interactions between this community board, GitHub, and the HA people! any updates on this? I just bought a few more… I made it work using command line sensors. but that’s allot of configuration for each one. how far off are we? anything we can do to help? Thanks! I would love to see this get integrated in to home assistant! I have a HS107 (the dual plug version) and planning to get more if i can get this working. Unfortunately i lack the skills to accomplish this on my own. I think the only thing that needs to be done is to update the HA code. the module it relies on (pyhs100) has been updated to work with the hs300 and for now you can use that along with a command line sensor setup to get it to work until native support is built in. I wrote a few shell scripts to make use easier, but still with 6 plugs, states and energy stats, it becomes allot of sensors and configuration, so i have not yet deployed these in to “production” in my house yet. So on the 0.88 update it says the pyhs100 library is updated. But when I plugged in my HS300 strip, it still doesnt work right. Anybody else having the same issue? Still not working for me ether. I think I am missing something in the configuration. I have tried a few things but I’m no wizard with this stuff. Did you set up the sensors in the config? I havent yet. But while it recognizes the strip, it doesnt give the option to control the individual plugs. I looked on the github page, and interestingly their config was a bit different. Instead of listing the tplink under switches, it was it’s own entry, and you add something regarding discovery true. Will play with it later today when free. I think we are still waiting for someone to update the HA module even though the underlying python has been updated to 0.34. I just tested mine using the python and can control each outlet on the PS. See this forum post for some info on that. Thanks Guys! At this point it is beyond my current skills and will most likely be updated in HA by the time I understand how to do it.